Former St Helens favourite Ben Barba, the reigning Man of Steel, has been sensationally sacked without playing a game for his new club. The 29-year-old full-back, who was Super League's leading tryscorer in 2018 with 28 touchdowns, was released from the final year of his contract with Saints after he was handed a chance to resurrect his NRL career. The NRL's website, NRL.com, is reporting Barba was captured on CCTV - and spotted by several witnesses - physically assaulting his partner and that Townsville police are now investigating. Barba, who was sacked by Cronulla at the end of the 2016 season after testing positive for cocaine, was handed a 12-month deal with North Queensland Cowboys, who on Friday announced they had terminated his contract due to a "significant breach of the terms". Cowboys chairman Laurence Lancini said: "When a player joins the North Queensland Cowboys he agrees to abide by the terms of the contract. Reports in Australia say the Cowboys were investigating an incident involving Barba at a Townsville casino. Barba had a brief spell in rugby union with French club Toulon following his departure from Cronulla before being snapped up by St Helens in the summer of 2017. 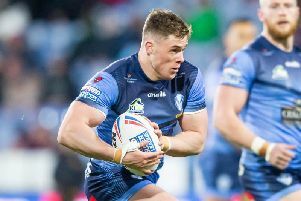 He was forced to serve the remainder of a 12-match ban for cocaine use but made a big impact in 2018 when he won the game's most prestigious individual award and was named in the Super League Dream Team. Barba had been named in the Indigenous All Stars team to play the New Zealand Maori in the NRL's traditional season pipe-opener on February 15 but now faces an uncertain future in the game.